Frederick Carlton "Carl" Lewis (ojoibi July 1, 1961) je asereidaraya is a former American ori papa to gba eso Olympic 10 ti 9 ninu won je wura, ati eso 10 Idije Agbogo Agbaye 10, ti 8 ninu won je wura. His career spanned from 1979 when he first achieved a world ranking to 1996 when he last won an Olympic title and subsequently retired. Lewis is now an actor and has appeared in a number of films. ↑ Dillion, Nancy (August 10, 2008). "After the Gold, Their Lives Still Glitter. Champs show you CAN take it with you.". Daily News (New York: Daily News, L.P.): p. 26. 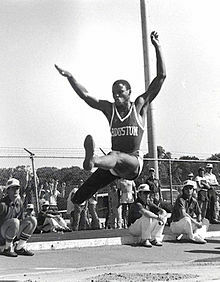 ""Carl Lewis won nine golds in sprinting and the long jump, including four at 1984's Los Angeles Games, two at the 1988 Seoul competition, two at the 1992 Barcelona Olympics and one in Atlanta in 1996. Lewis, 48, is now an actor and has a role in the upcoming jewel heist movie "62 Pickup" starring comedian Eddie Griffin. 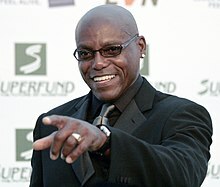 His Carl Lewis Foundation helps youth and families get and stay fit."" Àtunṣe ojúewé yi gbẹ̀yìn wáyé ni ọjọ́ 30 Oṣù Keje 2013, ni ago 16:40.